Tamworth have played at The Lamb Ground since 1934. The Lamb Ground takes its name from a pub, the Lamb Inn, which formerly stood nearby. It all looks rather bleak, and overlooked by the huge Snowdome leisure complex not far away. The ground has a capacity of approximately 4,000, and a directors box. All seating is in the Main Stand, which was constructed in 1997. The Main Stand occupies one side of the pitch, with a covered terrace known as the Shed on the opposite side. A number of old terraced houses back on to the ground, so I hope the occupants are supporters! The entrance and Director’s ‘suite’ consists of random interconnected containers! 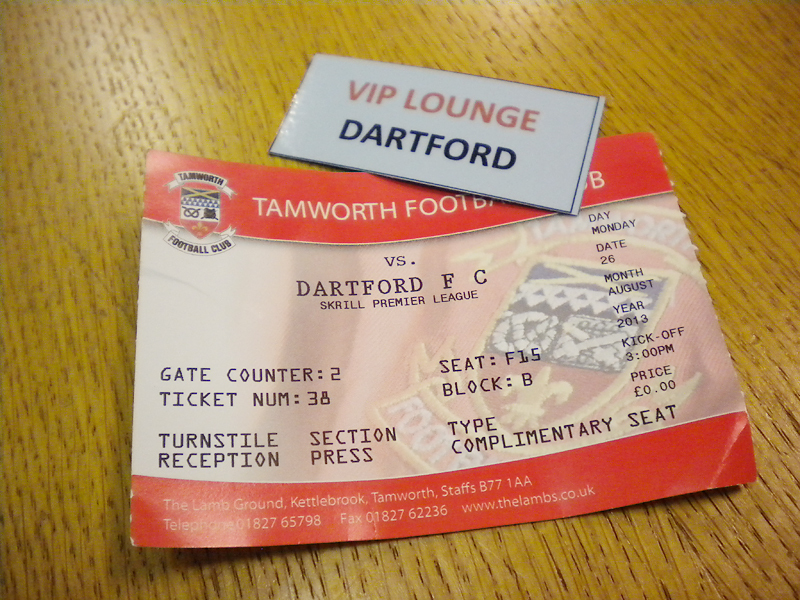 This year I was granted access to the VIP lounge (another container) although everyone who came early went in the Tamworth Supporters Bar which was cosy. This time there was no segregation of supporters, which was nicer. Last time, having segregated people during the match, the stewards proceeded to allow everyone to exit at the same time! 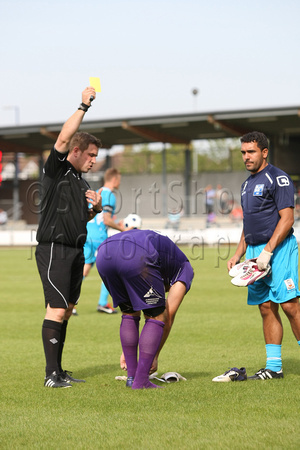 The match was peppered with 3 yellow cards for each side – quite an achievement. And although a lot of the action seemed to happen around the Dartford goalkeeping end, the defence held and Dartford ran away with the ball to score 2 good goals. 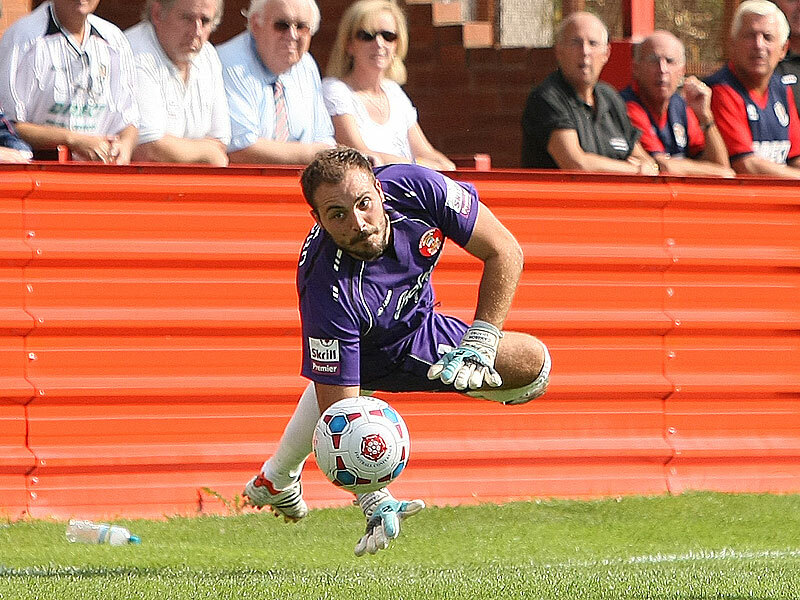 At least this time purple Tamworth Goalkeeper, Cameron Belford, didn’t try to change his boots to waste time at the end of the match as did his predecessor Breeden at Dartford’s match last August! Dale Belford (Manager) is his father, and he seemed pretty cheerful before the game started. I didn’t speak to him at the end. Dale Belford started his career at Aston Villa (as did Lee Hendrie – sounds familiar) and played for Tamworth starting in 1988, and again in the 1990s as a goalkeeper. At the start of the 2006–07 season, Belford re-joined Tamworth for his third spell occupying the role as player-goalkeeping coach. 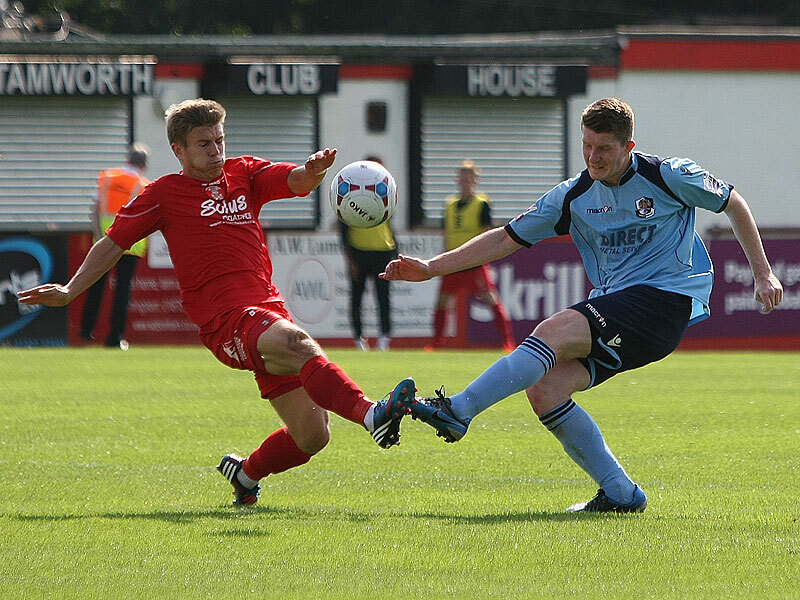 His father is Tamworth kitman, Buster Belford. Keeping it in the family! In 13 April 2011 Tamworth legend Dale Belford managed the club for the remaining four games of the 2010-2011 season. 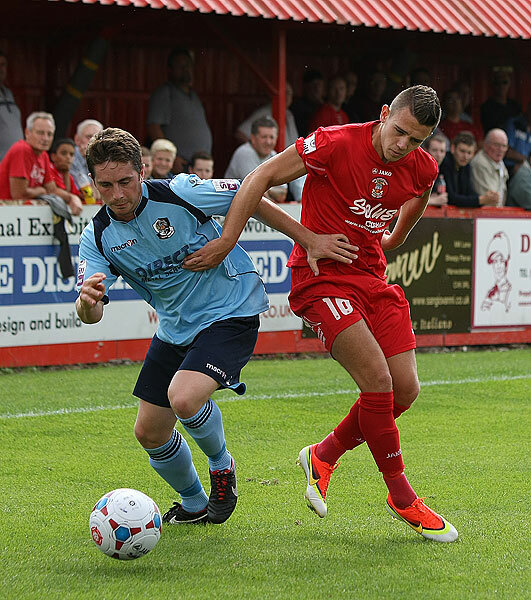 Belford led Tamworth to last day safety with a 2–1 home win over Forest Green Rovers, with Jake Sheridan scoring the all important winning goal. Tamworth were defeated by Everton in the 3rd round of the 2011–12 FA Cup 2–0 on 6 January 2012. Around 5,000 Lambs supporters made the trip to Goodison Park. The previous manager was relieved of his manager duties following a meeting with chairman Bob Andrews on Monday 14 January 2013. Dale Belford was appointed as caretaker-manager for the foreseeable future with former Lambs player Scott Lindsey as his assistant. and I guess everyone has to try and make a living. Inbetween, I read that in January 2011, Hendrie disappeared off the UK scene for a while. Hendrie signed two-year deal with Indonesian (Java) club Bandung FC in Indonesia’s breakaway football league, who were second bottom of the league with two defeats after two matches. Bandung aimed to use Hendrie’s star appeal to boost the growth of talent at the club. “He will act as a link-man and second striker who will supply our forwards … his presence will give us a lift,” Bandung Chief Executive officer Mohammad Kusnaeni told Reuters yesterday. “I am proud to have the opportunity,” Hendrie said at the (Indonesian Premier League) LPI’s offices in Jakarta. Despite earning £24,000 a week in his heyday, (and now seeming somewhat insignificant against Gareth Bale’s reported £300,000 a week 6-year deal with Real Madrid) Lee Hendrie ended up in deep red financial straits. Hendrie was due to appear in relation to his bankruptcy, but a judge at Warwick Combined Court has issued an arrest warrant against him on April 29. In May it was reported A judge had ordered that former England international Lee Hendrie be arrested and brought before the court following a failure to appear for a hearing over his bankruptcy. The former Aston Villa midfielder, now 36, was made bankrupt in 2012 after racking up debts with HM Revenue and Customs. Never seemingly out of the press, or the courts, his wife has been investigated over allegations of false insurance claims. This is something that has dragged in Footballer Trevor Francis’s son over claims of burglary that were overturned. Hendrie, who was made bankrupt in 2012, was ‘almost in the financial gutter’ at the time of the insurance claim and was desperate for money, still then living in a £1.7 million 6-bedroomed mansion in Finwood Lawn, Rowington. Of course, Tamworth isn’t all about moronic footballers. Had you heard of the Tamworth_Manifesto? Well, you may be interested to know that Sir Robert Peel wrote the Tamworth Manifesto – you must remember from history lessons, the 1822 Home Secretary who created the Metropolitan Police – then called Bobbies and Peelers? Well, during his life (1788 – 1850) and his political career (1809-1846) there was much social reform, including the repeal of the Corn Laws which had been introduced to protect British agriculture but were damaging to Ireland during the Potato Famine. In 1834 Peel, in the manner of a reformer, published the first Manifesto to his Tamworth constituents setting out, as has never before been done, his support for reforms and “to fully convince the country and electorate that there was a substantial difference between his brand of conservatism and that of his predecessor and ‘old tory’ Wellington.” (The Iron Duke). The Tamworth Manifesto is widely credited by historians as having laid down the principles upon which the modern British Conservative Party is based. And, from the sublime to the ridiculous, you may also remember the Tamworth Two – two piggies who escaped from certain death at the abattoir and captured the hearts of the nation. Known as Sundance and Butch, they were rehomed in Kent. Well, one reached a ripe old age of 14 and finally succumbed. Ahh. Which brings us nicely back to the title about Lambs to the Slaughter. Neat, huh?